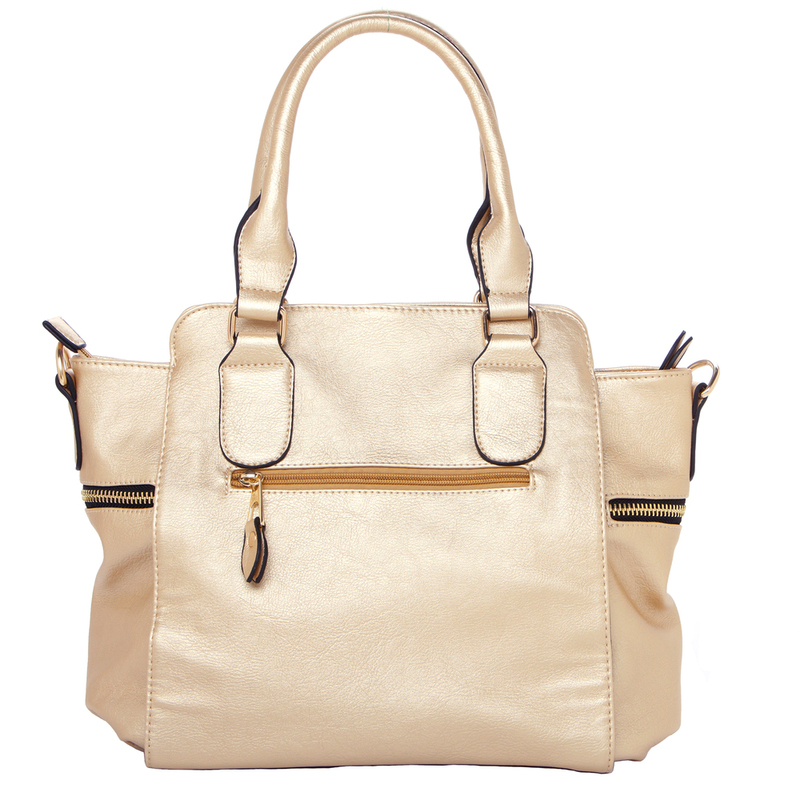 A gorgeous and fashionable shopper tote bag with a classic bucket tote shape and glamorous gold-tone hardware. Spacious interior features fabric lining as well as 2 slip pockets and 1 zippered pocket with the 3 zippered pockets on the exterior (1 on the back and 2 on the ends) for additional storage. Approximate Dimensions: Exterior - 15.5" W X 11" H X 5.5" D; Interior - 15.5" W X 9.5" H X 5.5" D; Handles - 6.5" handle drop; Shoulder Strap (fully extended) - 24" shoulder drop. 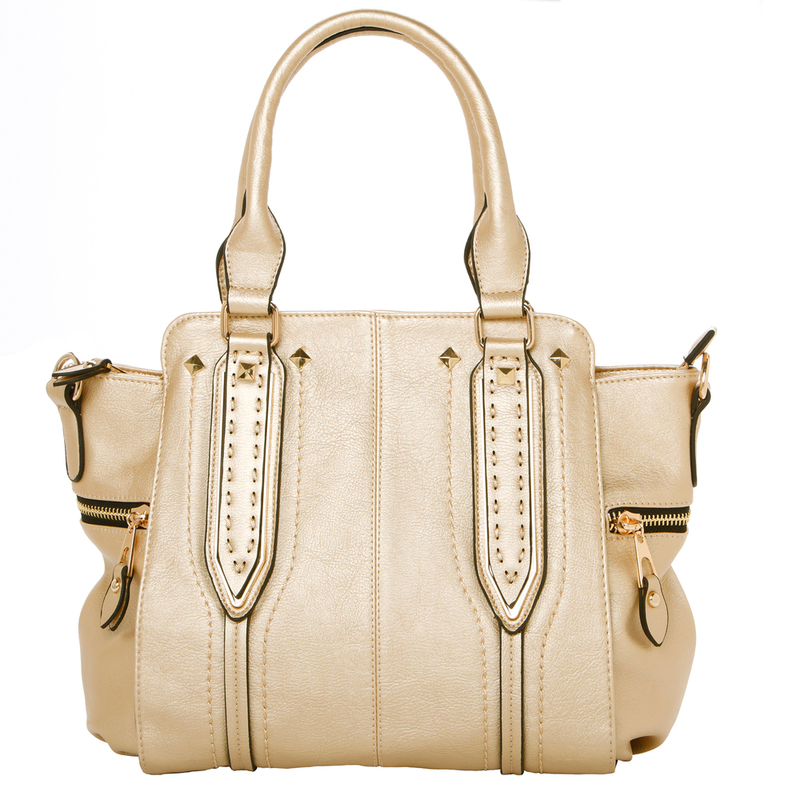 Made of always-stylish leatherette, this women’s handbag features a classic bucket tote design that gets a modern makeover with the addition of stylish stitching, sharp lines, and gold-tone metal studs. Combined, these stylish elements create a beautiful and refined look that will keep you looking good from season to season, from day to night, and from work to play. Inside, this top handle bag boasts a roomy and fabric-lined main compartment that uses 2 slip pockets and 1 zippered pocket to help keep your belongings organized and easy to find. More zippered pockets on the back and on each end of this day bag's exterior provide the perfect place to stash additional items, and you can use the 2 sturdy top handles and the adjustable and detachable shoulder strap to keep this satchel tote – and your daily essentials – close at hand. Ready to bring stunning style to your weekly wardrobe? Make this handbag purse a part of your collection today.